The autumn sibling of those green shamrocks that pop up during the spring, purple shamrocks grow well in milder temperatures and medium to low light. You can set these up as a hanging plant in your sunroom or place a pot on a ledge. They have a deep wine color that’s both striking and soothing, and perfect for the fall. Make sure to trim weak leaves and keep the plant healthy, but even on cloudy, cooler days, your purple shamrock plant will continue to color your sunroom. If you like the color purple, you should also consider African violets. They have the bright purple color that you might find in common violets, but these are larger and much more exquisite. African violets can grow in autumn and winter, but prefer full sun, so they do well in Texas autumns. They just need light, humidity, fertilizer, and regular rotation to ensure that they grow properly. Liquid fertilizer can be a smart option when you’re working with African violets. Meanwhile, if you’re looking for a plant that doesn’t require much attention, the round, verdant leaves of the ZZ plant are sure to catch your eye. This is a plant that can take care of itself. It can survive for months at a time without care and still remain healthy. The occasional minimal serving of water is all it really needs. Think of the care of a cactus, but without the prickles. It doesn’t require as much light as other plants, which makes it perfect for autumn. In fact, ZZ plants do best in indirect light. Not only do crotons thrive in fall weather, but they exude vibrant fall colors that can help your home feel a little more autumnal. Crotons are known for their multi-colored leaves. They can grow in bright hues of red, orange, yellow, green, and even black. The veins that run through the body of the leaf are deep red. A large pot of crotons will make a stunning addition to your sunroom, and they’ll be a perfect fit for the autumn weather. Plants can breathe life into your sunroom, and help to add that ambiance of an indoor/outdoor space. 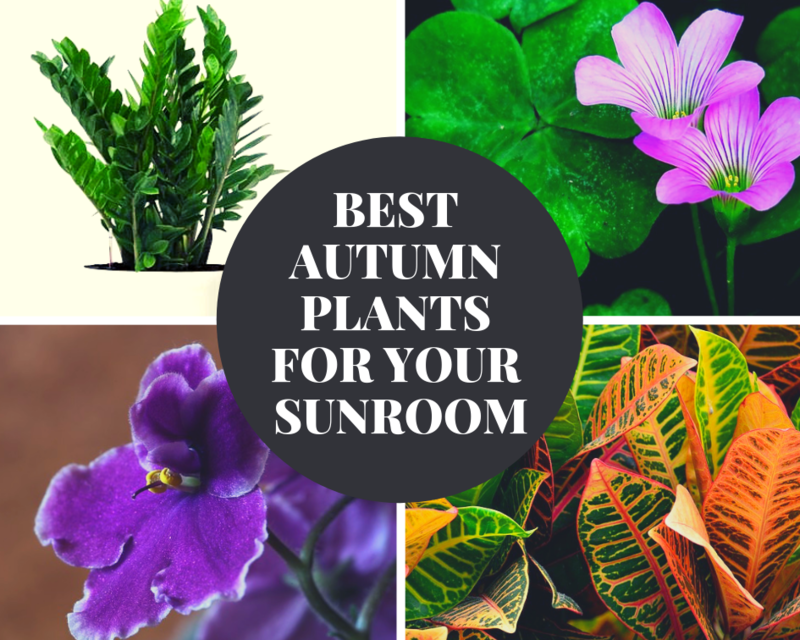 Whether your sunroom is used as an indoor garden or you just want a house plant or two to spruce things up, these are sure to do the trick. But when you need a quality, all-season sunroom, contact Sunspace Texas.